← Where do Bostonians get their News? Today, my friends and I went to Trident Cafe to see Michael Natkin give a free cooking demo. Natkin recently published a new book, Herbivoracious: A Vegetarian Cookbook for People Who Love To Eat, and showed us how to cook a recipe from his book, serving us samples of his creation. I found out about the demo through The Boston Globe’s events page, a tool I use frequently when trying to find things to do around the city. We got to the cafe, a place I’ve been before. I like Trident, but I don’t love Trident. I think it’s pretty overpriced for the quality and amount of food served. They definitely attract a more “hipster” and young crowd, I always see kids with sweatshirts from Emerson, Berklee and Boston University. The menu is seemingly organic, and definitely vegetarian friendly. However, I know the cost of juice. I have a juicer, I enjoy juicing. Tonight, I ordered the “Body Cleanse” juice. Carrots + Beets + Apple + Cucumber all juiced together for the $5. It was fine, but I like my juice served with ice, and the juice they served me was warm. Ew. I asked for ice, and was promptly served a cup, so I can forgive them. Over ice, the juice wasn’t bad. Not necessarily worth the $5, but now I know a recipe I enjoy and can juice at home. Natkin began just after 7, and it was a short demo. He told us a brief history about the meal he was preparing, a Vietnamese sandwich, a popular recipe from his new book. He went step by step through the process, showing how easy it can be to make something delicious. He was very personable, attentive to questions, and kept a smile through the whole demo. The ‘sandwiches’ were delicious – and he made them quickly. 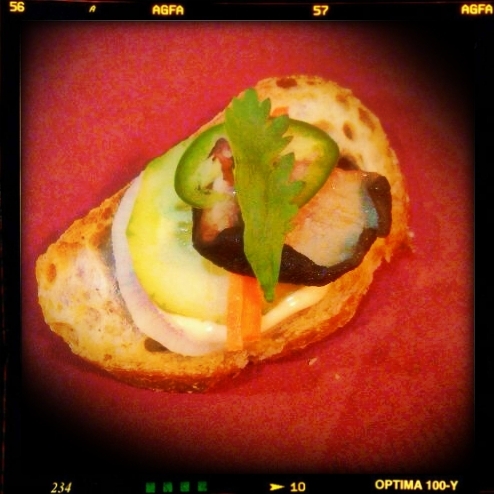 Slice of Baguette + Cucumber + Pickled carrots + marinated mushroom + mayonnaise + cilantro. They really were delicious, but making them seem like a simple dish isn’t entirely accurate. Pickling carrots can take some time, as can marinating certain types of mushroom. What he put together in about 15 minutes, is probably not going to be the actual preparation time for most people. Regardless, the author did a great job selling his book, many attendees purchased his book and requested a signature. Journalism major & sociology minor, finishing up my last year of college. This entry was posted in Uncategorized and tagged Herbivoracious, Juice, Juicing, Michael Natkin, Trident Cafe, Vegetarian. Bookmark the permalink. Hey Kimberly – thanks for coming out to the demo and signing. I didn’t get to show you that night since we just had the single portable burner, but those particular pickles actually are quite quick. You just bring vinegar, sugar, and kombu to a boil and pour it over the daikon and carrots, and then are ready to use when cool. I appreciate you posting about the event!